Water, Sodium Methyl Cocoyl Taurate, Cocamidopropyl Betaine, Sodium Cocoamphoacetate, Glycol Distearate, Glycolic Acid, Sodium Lactate, Cocamidopropyl PG Dimonium Chloride Phosphate, Polyquaternium 11, Disodium EDTA, Fragrance. I found this cleanser online and at Walmart. I use this twice a day, morning and night. It's great at removing my makeup and contains salicylic acid to help prevent acne. I love it. It claims to help with fine lines but I still have lines on my forehead that not very deep. I've been dealing with acne for about a year. Growing up i never had a huge problem with acne. I always seem to have great skin. I started have trouble when i hit my 20's, at this time i started going through depression. So perhaps it was the cause. I broke out on my kinda jaw area, a little on my forehead, and i was very dry around my mouth and nose area. The dryness made it very difficult to purchase cleansers and moisturizers. I often would get chemical burns on my mouth and nose area so i had to be careful with the products i purchased. I was becoming desperate and tried so many products. I felt hopeless. I randomly seen this product at cvs. Googled the item while i was in the store and thought why not. Plus it was on sale! Tge sane day i felt a difference in my skin. After the 3rd day i began to clear up. It has now been 3 weeks since i began to use this product and i must say i am delighted with the results. 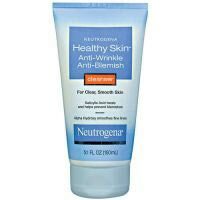 I use a clean and clear moisturizer after i was my face with this 2x a day sometimes 3x. I just need to stop picking at my skin and get rid of my scars and dark spots. I miss my clear flawless skin and hope to one day return to that. I look forward to the day i can walk around with no makeup and be confident. This product has helped little by little. Great exfoliating cleanser. Prevents acne and cysts. Helps to keep pores open. Doesn't dry out skin. Easy to waste because it's slippery and falls off my hands at times. I love this cleanser. I've been using this for a few months and I've only gotten a couple new blemishes which is pretty unusual for me. I even went through two PMS periods with nothing major popping up. I think the combination of salicylic and glycolic acid really works to exfoliate and keep the pores open which allows BP to penetrate and kill bacteria. I even use this around my eyes and I don't think it has caused any dryness there.